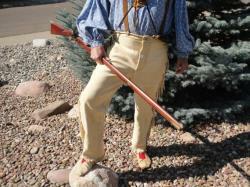 Miller, the painter of the 1837 rendezvous, depicted a variety of cloth and buckskin pants and pantaloons. Some were drop-front, some button fly. Belts were common, but so were single or double suspenders or galluses. 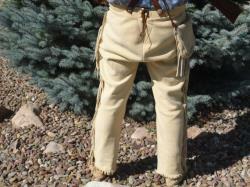 Many pants had an underfoot strap to keep them from riding up when on horseback. 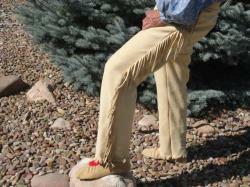 The accompanying photos show my own pants of commercial buckskin roughened on the grain (smooth) side to look like traditional brain-tan. They are button-fly with antler buttons. The waist band has a small amount of lace adjustment at the back. 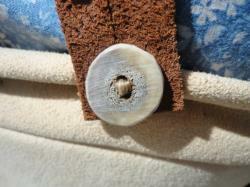 Either antler suspender buttons or belt loops are available at no extra cost. If you want the underfoot strap, i'll add it at no cost. I have leather suspenders available at additional cost. I don't have historical evidence of pockets, but we can talk about it. 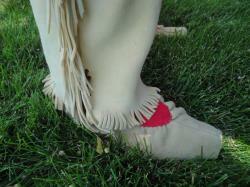 These pants are entirely consistent with the variety of styles and materials we know were worn that summer of 1837 on the green river at horse creek. You may want to add some dirt, grease, and smoke. You might want to order them a little large. I wear a 34 but made my pants a 36: it gives me more freedom of movement and lets me tuck in an extra-heavy shirt. (and gives me growing room). Contact me for sizing info and to discuss material choices. Cowhide suspenders attached with antler buttons $25. This item is also available in brain-tanned buckskin smoked in the traditional way right here in montana and hand stitched with sinew. Contact me for options and prices. This photo is for display. Your item will be made to order and will be similar.